Held an event for children of military members and Merman provided more then expected. We had a gas leak and had to evacuate. He was able to move on with the show. It went so smooth that people thought the evacuation was part of the act. The kids loved the show and were all laughing the entire time. Would recommend him to everyone in need of face painting, balloons and shows. pirate adventure - an entertaining and fun show! Had Merman come to our Resort for a Pirate Evening. Very entertaining and lots of interaction with the kids and adults. Pet tarantula- a hairy experience! Fire eating amazing. Nice grab bag goodies especially the moving fish! Thanks for the great evening and we will have you back next year! MerMan is awesome. He has the complete package! He entertains, he is hilarious and he knows how to work the crowd and keep everyone engaged. Everyone loved him. He did a great service to the town of Farmvllle.VA. National Night Out event, sponsored by Virginia Family Services. Thank you again MerMan!! We were very pleased with this team of face painters! They were friendly and easy to work with. They followed up before the event. They were on time. They were efficient, great with our customers and professional. We ended up getting a lot more people at our event than expected and they rolled with the punches. Would definitely recommend them and I'd use them again at future events. Thanks for helping make our event a success! -Beth with Whole Foods Market--Elizabeth T.
Excellent Mer provided a Magic show for my 8 year old granddaughter and her cousins ages 2-10 in my home. 50 minutes of age appropriate entertainment was provided. Mer's personality was a hit by children and adults alike. I was very pleased that he did include all the children in his performance along with the Birthday Girl. He arrived right on the time and was very pleasant to work with, so easy going. I hope to be able to employ Mer in the future for a longer Adult version of his Talent. It was My pleasure to work with him. I received many compliments of my "Great Idea" to hire him. Thanks for making me one Happy Grandma with a finicky 8 year old Granddaughter! Thank You So Much!!! !--Norene L.
Wonderful Time Had By ALL!!!!! 5 Stars!!!! LOVE! LOVE! LOVE! LOVE MERMAN!!!!! He helped pull off a rained in Annual Company "Picnic". Very courteous, friendly and helpful. It was almost like he was part of the company. We will DEFINITELY use his services again. Thank you, merman & your staff. GREAT JOB!!!!! Greystone of Virginia--Toya H.
Excellent customer service. He called me a couple of times to customize the magic show that I wanted for my party. He was very funny and the kids enjoyed helping him out with the magic show. 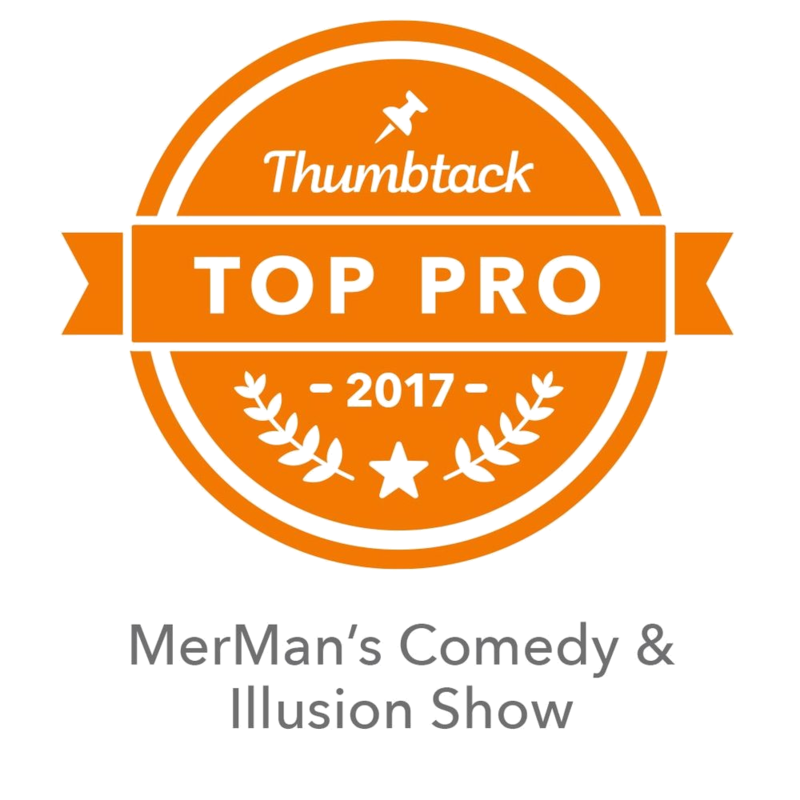 My daughters were too shy to get up in the front but Merman made it work and was still able to include them in the show. Thank you! --Debbie M.
What a fantastic experience for both children and the adults!!! Our guests are still talking about how great the show was! MerMan kept in touch with me, arrived early, got right to work wowing the crowd. 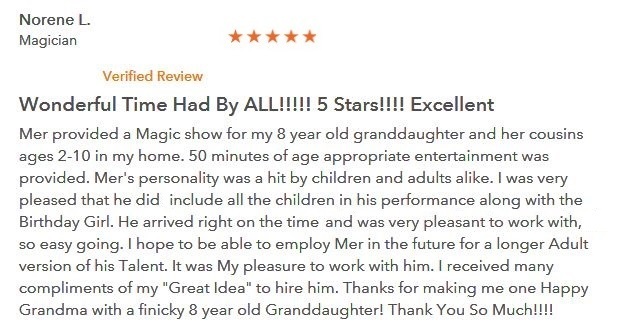 I would highly recommend Him and can't wait to book him aqain!--Sandy m.
Mr. Merman did 3 shows at the Elementary School where I teach. The kids love his magic and his connections to the No Bullying program were great! He did 2 programs during the school day and one evening performance with students and parents. He included students with all his performances. My 2nd great students thought he was wonderful. His program started lots of good talking points with all the students and his magic kept them interested in the show! Fun, Frolic and learning was had by all ages!--Cheryl D.